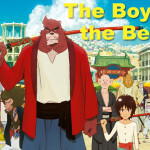 The Boy and the Beast is the latest creation from Mamoru Hosoda and his team at Studio Chizu, the same folks that brought us such animated gems as Summer Wars and Wolf Children. Following its theatrical run, the film has finally been released this month to DVD and Blu-Ray. Due to the untimely death of his mother, Ren finds himself living on the streets of Shibuya, cursing humanity for his current predicament. 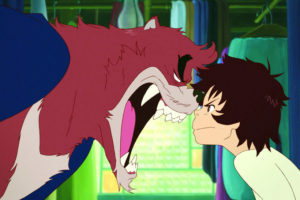 It is here that Ren comes into contact with Kumatetsu, a brash bear-like beast who offers Ren an apprenticeship. 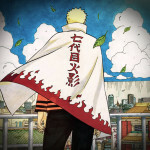 While Ren initially ignores the offer, he ends up following Kumatetsu and finds himself in Jutengai, a city in the Kingdom of Beasts, where the preparation for an ascension of a new lord is underway. One of the beasts vying for the position is none other than Kumatetsu, and eventually Ren decides to become his apprentice in order to learn how to become strong and self-sufficient. But Ren can’t ignore the human world forever, and his upbringing as a beast comes into conflict with his future as a human and who he wants to be. It would also seem that a darkness is growing in Jutengai, the likes of which only the combined powers of master and pupil can stop. I’ve enjoyed Mamoru Hosoda’s works since he directed the Digimon Adventure Movie and Digimon Adventure: Our War Game. Since then, Summer Wars and Wolf Children have made it on my list of favourite movies. Their focus on humanity, on the subtle and quiet without losing depth or humour, these are the aspects of his films that I love. Much to my delight, The Boy and the Beast continues this type of storytelling, and has cemented itself as another one of my favourites. It takes a concept that is well worn and familiar, giving it a new lick of paint with the addition of beasts and the fantastical to a master and apprentice story. The bickering Ren and Kumatetsu and their master/apprentice dynamic may be tiresome at first, but once their humanity shines through, it’s hard not to enjoy the characters as they are. Because despite their clash of brash personalities and constant arguments, whether it be about Ren refusing to eat raw egg and rice to the fall outs over Kumatetsu’s poor teaching ability, the two are able to persevere and become stronger and more whole through what they teach each other. 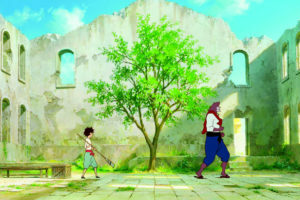 As is true of prior Studio Chizu movies, The Boy and the Beast is gorgeously animated. The animation is fluid in that it stops and starts, it breathes. This means that characters are just as active in their moments of rest as they are in the many wonderful action sequences. This also lends itself to a lot of great physical humour in the animation, mostly centered around Ren and Kumatetsu’s interactions with each other. It never turns into slapstick, but it’s the hardest I’ve laughed during a Studio Chizu movie. The movie is full of beautiful hand painted backgrounds and colours that contrast the worlds of Shibuya and Jutengai, and many fantastic fight sequences. The fighting animation has a great sense of weight and anticipation, and it’s a joy to watch. Even the emphasis on sweat is incredible, it’s actually beautiful. Yeh, the battle sweat animation in this looks great. It sounds weird but it’s true. It just goes to show that an emphasis on detail can make the strangest things aesthetically interesting, even a brow drenched in sweat from the exertion of a hard fight. The Blu-Ray comes with English and Japanese audio. I saw the Japanese version in cinemas first, so that version is my preference, but the English voice acting was great as well. 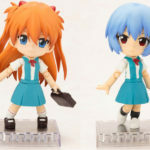 Aside from that, the Blu-Ray also has a plethora of special features, including a making of documentary, Japanese cast interviews, and promotional TV spots and trailers in Japanese and English. 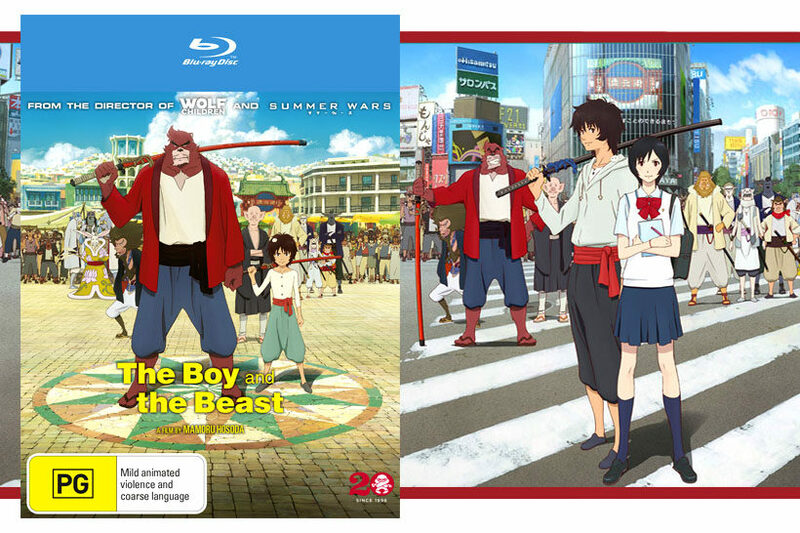 The making of documentary is great and has a lot of fascinating insights from director and writer Mamoru Hosoda, who talks about his inspiration for The Boy and the Beast and the themes of the movie. 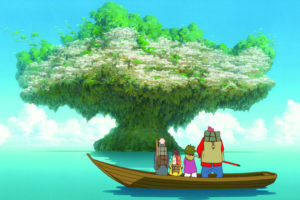 The documentary also focuses on the animation and painted backgrounds used in the film, interviewing several Studio Chizu employees and examining their work. We’re also treated to a quick look at hand drawn storyboards and scripts that Hosoda was working on for the movie, and how they compare to the final product. The making of documentary was my favourite aspect of the extra features, but the Japanese cast interviews where they answered questions together and took a quick tour through the animation studio were also very interesting. There is no doubt that the Blu-Ray was full of interesting bits and pieces, but I wish there had been an image gallery. While watching the cast interviews and documentary, there were several times that the camera swooped by character design sheets and I would have liked a closer look at them. As it was, they were barely shown and the camera doesn’t linger on more than one or two before moving on. One of the many things I like about Hosoda’s films is that they never end exactly the way you want them to, but they always end the way they should. I remember finding myself confused with the ending of Wolf Children during my first watch, not entirely satisfied at the time. After watching the film again, I realised this perception was coloured by my expectations for a stereotypical happy ending, without implication or complication. 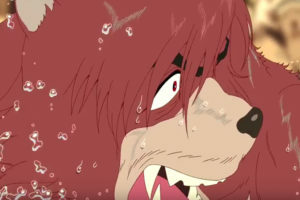 I briefly felt the same way when watching the finale for The Boy and the Beast for the first time. But people’s stories aren’t like that, and I will always appreciate this kind of representation of humanity, even if it is fantastical. Is it a new story? No. But it does what the best well-worn stories do: tell a familiar story in a new setting; a setting of intense fun, passion, and beasts of all shapes and sizes. The presentation far outweighs any misgivings towards a tried and true story formula, and the number of special features make this film an easy recommendation.